Descent 258 is now available! 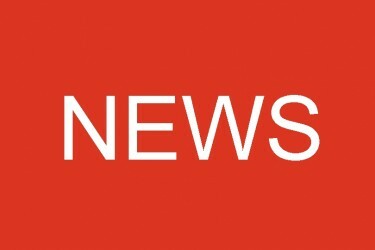 As ever, Newsdesk will bring you up to date with news at home and abroad. A new world depth record has been set in a cave in the Western Caucasus in Georgia. The latest volume in the hugely popular Northern Caves series is now available. Two stunning new calendars are available to choose from, Wild Places is again stocking the Underground Worlds calendar and there is one from Speleo Projects, as well. There’s more information about the special event being hosted at the Royal Geographical society in London from 1st to 4th on December entitled A Golden Age of British Cave Exploration. 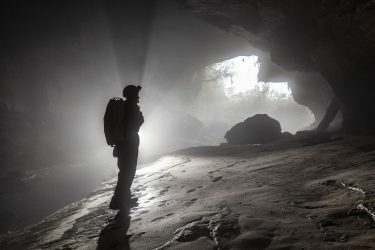 A warning is given about possible plagiarism on a new cave-related site, Start Caving; and another warning is given of the dangers posed to cavers by tick-borne diseases. On a sad note, Descent notes the death of Bryan “Scoff” Schofield, known and loved by many. But remember that this is just a short sample of the range of items covered by Newsdesk so do take a look for yourselves. In news from the Peak District, after 33 years trading, the popular Hitch ‘n’ Hike has closed. Dave Nixon shares his memories and wishes the owners all the very best in their future ventures. Digging has recommenced at Eldon Hole after an exhumation licence has been granted following the discovery of human remains in the dig, and work has been completed on the anchors on the entrance pitch of the cave. On Mendip, there’s news of a breakthrough in Stock Hill Mine Cave, and there have been more rescues in Box and Brown’s Folly Mines in Wilshire and one closer to home in Goatchurch cavern. Mendip also pays tribute to Lewis Frith, known as Biff, who died in July. In news from the north, there’s been an accident in Gaping Gill when a ledge collapsed, injuring a caver during the set up for a winch meet, and another farewell, this time to long-time Craven PC member Len Cook. In happier news, the renowned caving film-maker Sid Perou celebrated his 80th birthday and the Kendal Caving Club have reached the grand old age of 60! There’s also news of a discovery in Northumberland, one of the UK’s lesser known caving regions, where for many years, one of our dogs held the record for discovering the most northerly cave in England, but that’s another story! In the Forest of Dean, cavers have been using dowsing in the hope of locating cave passage. In Ireland, the 33rd SUICRO Symposium will be taking place over the weekend of 27th to 30th October at the Long Melvin Holiday Centre in Garrison. The section on Welsh news tells of an unusual fund raiser involving a large dragon. That should appeal to Game of Thrones fans. There’s also some controversy about the question of grills on the Black Mountain. Access has been regained to Igam Ogam and there’s news of a new shaft discovered during the recent BCRA field meeting. In Scotland, progress has been made with the UNCABAC dig during the annual Mendip Migration, and more pushing has been done in Poll Breugair in Applecross. There’s a fantastic six-page article by Matt Ewles of York Caving Club, setting out the story of the discovery in 2007 of Excalibur Pot on the North York Moors and the history of exploration, including a beautifully presented double page survey and numerous photos. In archaeological news, Rob Dinnis takes a look at the Neanderthals and talks through the investigations being undertaken at Ffynnon Beuno Cave in North Wales and shows how the research is helping to improve understanding of life in Ice Age Britain. Abroad, a four-page spread tells of the work done by the fifth Shepton Mallet Caving Club expedition to the Doi Phu Kha mountains in Northern Thailand where over 3.6km of passage has been surveyed in a total of eight caves. The article gives a great flavour of the trip and is illustrated with photographs and surveys. 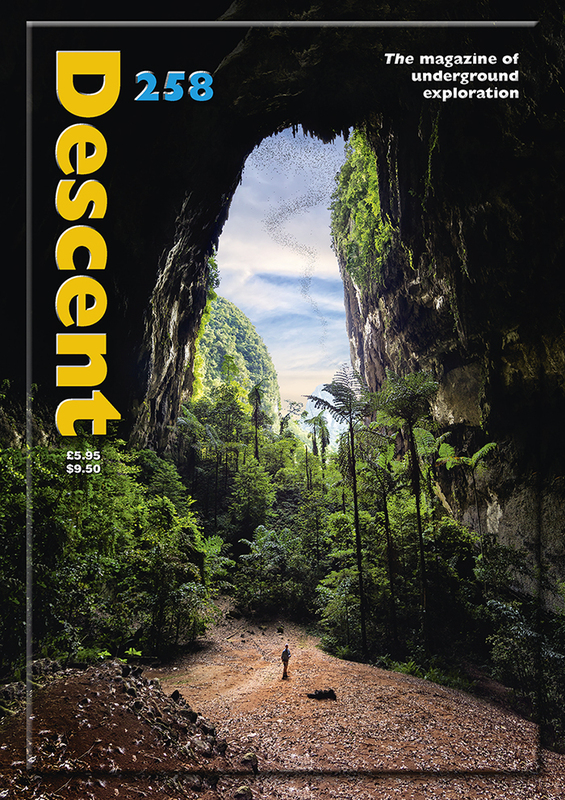 Roo Walters gives an account of the 2017 International Congress of Speleology in Australia, where Descent editor Chris Howes won a well-deserved Best in Show for his amazing photo of the bat flight from Deer Cave in Mulu that makes up the stunning front cover of this issue. The next congress will be in Lyon in France in 2021. Be there! In the Viewpoint slot, Steve Roberts looks at the controversial widening of a constriction in Ogof Draenen and opens up the thorny subject of caving ethics, discussing what is – and what’s not – considered acceptable in the caving world. If you’ve ever been tempted to make something just that little bit bigger, read this before giving in to temptation. Speleo Reader features Martyn Farr’s new book, The Darkness Beckons, and there’s a round-up of other publications. The Gear Review talks about the SOL emergency bivouac bag and gives the result of the competition to win a Gerber Multi-plier tool featured in the August issue. 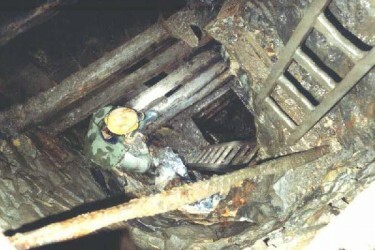 To round the issue off, Clive North shares memories of Sludge Pit on Mendip to celebrate its 50th birthday and in Wales, Malcolm Stewart takes a look of what he found lurking in the depths of the gear-eating Green Canal in Dan yr Ogof. Do get in contact with him if you’ve ever lost something down there! And finally, a fascinating letter from Joe Duxbury takes a personal look at a caver’s relationship with darkness and asks how you feel about that particular ‘old friend’.